The Columbia River K110KKP Humdinger is a large fixed-blade knife for hunters and outdoorsmen and designed by master knifemaker Ken Onion. Its curved, deep-bellied, high-carbon blade is tough enough to skin a bear, and features a corrosion-resistant black finish that protects the steel from the wear and tear of back-country use. The glass-reinforced nylon handle is textured to prevent it from slipping out of your hand and its ergonomic shape provides plenty of leverage for the hard tasks. 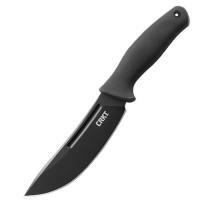 It comes with a tough polypropylene and polyester weave sheath for protection and portability.